So I am so psyched to start my annual leave this Monday. Being the control freak that I am I have a list from the stuff that I have to pack (must not forget traveling sewing kit), to the fun filled activities that my fambam and I will enjoy next week. That is why when it came to booking our trip, I wanted to get a travel agency to do it for us, to have a hassle free vacay. 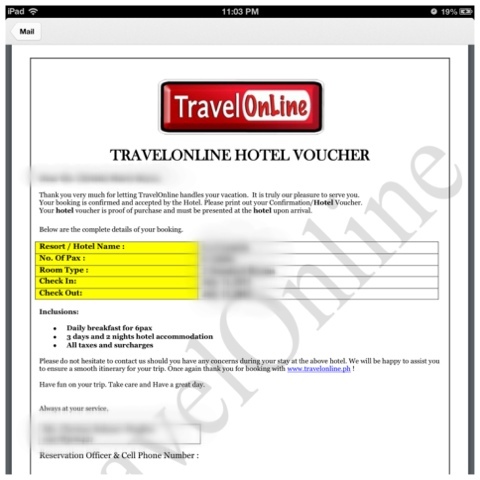 Luckily, I found TravelOnline! They have super reasonable packages and thus far, superb customer service. The package we got was so sa-weet! Hotel, flights, food, massages, the works. Case in point, I called Zest Air to add a checked luggage. I know I will overpack because I am a girl. I was expecting to experience some pain in doing this because I've coordinated with economy airlines before and this is how their customer service usually works. The agents, while well-meaning, do not provide real help given the processes that they are fed. Anyway, enough with the rant on customer support, long story short, my travel agent was able to get things sorted out for me in a matter of seconds that took me 3 hours waiting online and talking on the phone with the Zest Air folks. And I mean seconds, I kid you not. The word "literally" literally applies here. I will update this post after our Boracay trip next week for a full report on the agency. Wish me loads of fun, happy, rainbows, unicorns, confetti time with la familia! When was the last time YOU had a long vacation? What's up i am kavin, its my first time to commenting anywhere, when i read this piece of writing i thought i could also create comment due to this brilliant article. I really love your article. I really appreciate your great work thanks a lot. My article said he loves you too. That's right, he's a man.